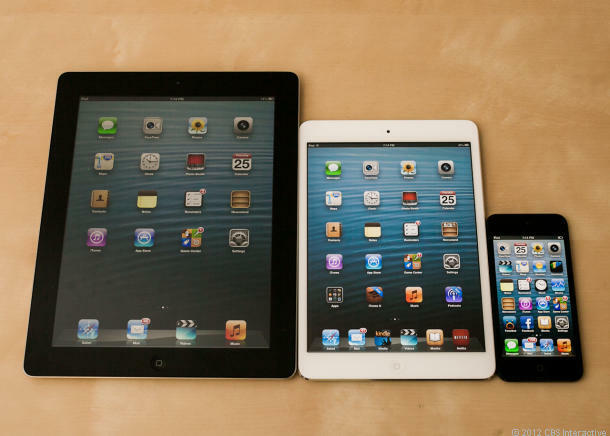 Ipad mini…The perfect size, but a large price…Still an eye candy now-a-days ! 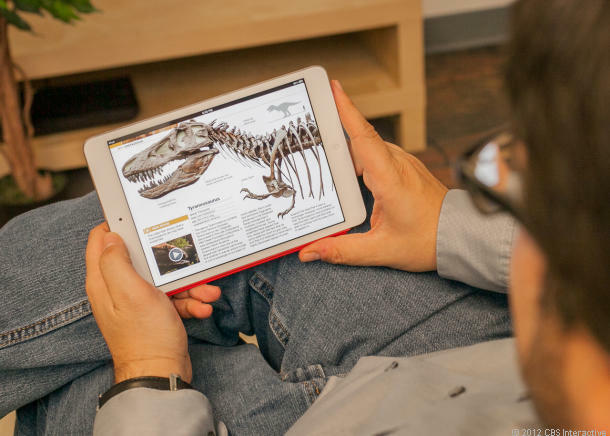 The good: The iPad Mini’s ultra-thin and light design is far more intimate and booklike than the larger iPad, and its cameras, storage capacities, optional LTE antenna, and general functionality offer a full iPad experience. The display’s dimensions elegantly display larger-format magazines and apps. The bad: The iPad Mini costs too much, especially considering the lower resolution of its 7.9-inch non-Retina Display. The A5 processor isn’t as robust as the one in the fourth-gen iPad and iPhone 5. Typing on the smaller screen is not quite as comfy. The bottom line: If you want the full, polished Apple tablet experience in a smaller package, the iPad Mini is worth the premium price. Otherwise, good alternatives are available for less money. The tablet landscape, at the smaller-screened end, has become about pricing. Or so it seems. Don’t tell that to the iPad Mini. Apple’s long-awaited, and finally real, tinier tablet is remarkably thinner and lighter than its big-boned newly arrived fourth-gen iPad sibling, but it also starts at $329, a price that’s well above the bargain-basement $199 target floated by devices like the Nexus 7, Amazon Kindle Fire HD, and Nook HD. Certainly, the tablet playing field — especially when it comes to media — is leveling. The Kindle’s book, video, and app ecosystem is impressive in its own right. The Nook has made gains with its apps and services. Android has Google Play. Regardless, none of these can truly compare to the breadth of content from Apple’s App Store and iTunes. The App Store is Apple’s great gold mine, and the iPad Mini’s price seems to be banking on you knowing that. And, in that sense, the iPad Mini may be worth its price. But, the original iPad hit a sweet-spot $499 price that few competitors could match. The Mini’s price is about $130 higher than many similar 7-inch tablets that undercut it. It’s even more expensive than some newly-arriving 8.9-inch tablets from Amazon and Barnes & Noble. The iPad Mini is really a shrunken-down iPad 2. Or, a larger iPod Touch. The original iPad was a larger iPod Touch, too, in a lot of ways. That didn’t make it any less appealing. Here, the use case isn’t laptop alternative — it’s Kindle alternative. This is a compact reader/viewer. Of documents, magazines, movies, games. Maybe even of editing or creating. And it’s spectacular at being portable. What’s unique about the Mini? Without a doubt, it’s the design. It’s cute, it’s discreet, and it’s very, very light. It feels like a whole new device for Apple. It’s light enough to hold in one hand, something the iPad was never really able to achieve for extended periods of time. It’s bedroom-cozy. Other full-fledged 7-inch tablets feel heavier and bulging by comparison. This is a new standard for little-tablet design. It makes the iPad feel fresh. After a week of using the iPad Mini, it seems to find a way to follow me everywhere. It’s extremely addicting, and fun to use. But oh, that screen. It’s not bad, not at all, but it’s not Retina Display. It’s not even as high-res as other 7-inch tablets. If you’re an obsessive over crisp text, you’ll notice the fuzziness. If you’re comparing the Mini to a laptop, you won’t. I wanted that display to be as good as the one on the iPhone 5, iPod Touch, and Retina iPad. It isn’t, not now. It mars the product for me, because otherwise, the screen size and its aspect ratio is perfect for handling comics, magazines, and reading apps. Is the iPad Mini worth its premium, at nearly $130 more than some of the competition? If you’re looking to invest in an iPad for the least amount of money, the answer is yes. If you’re investing in iOS-land for the first time, this is a very good starting point. 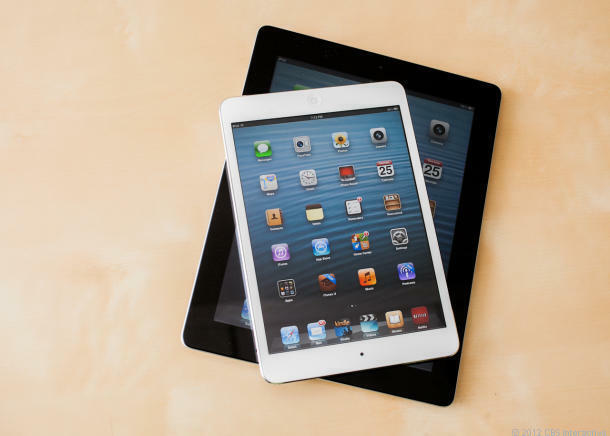 A Retina Display and a lower price would have made the iPad Mini perfect. 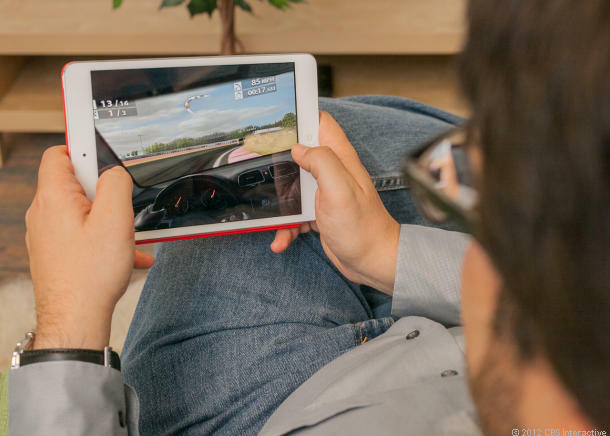 The fourth-gen iPad, in contrast, is a superior device under the hood, with much faster performance and a better-quality screen. Still, for many people, the Mini will be preferable because it’s less expensive and perfectly portable. For others, it’ll be the second iPad — the kid iPad, the beach iPad. I love this iPad, I’m just not sure I need to own it. Regardless of your feelings of the Mini’s price, or its A5 processor and non-Retina 7.9-inch display, here’s what you’ll notice when you pick it up: it’s really shockingly nice to hold. The iPad Mini is a design shift from the iPad, and perhaps the biggest one in the iPad’s entire history. Despite how popular the iPad’s been, it’s not really a device that’s very comfortable to use when not sitting down or at a desk. It’s a use-when-you-get-there device, or use-when-comfortably-seated. An iPhone or iPod Touch is truly mobile, and the iPad is only halfway there. That’s no longer the case. 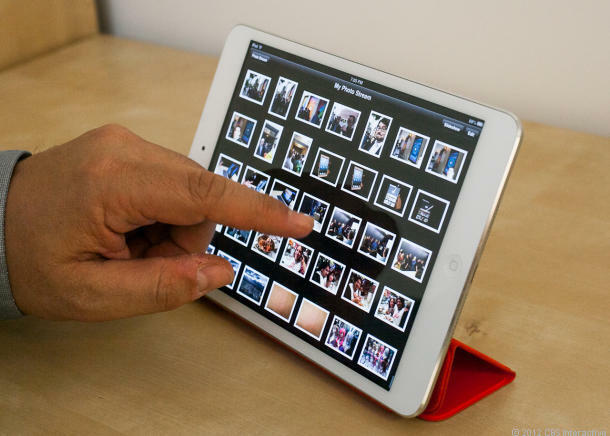 The iPad Mini is an extremely easy-to-hold tablet that, despite its wider form, feels as light as a Kindle. Not a Kindle Fire, but a Kindle. At 0.28 inches thin and 0.68 pounds (0.69 for the LTE versions), it’s the slimmest and lightest 7-inch-range tablet around, although it has a larger footprint (7.87 inches by 5.3 inches). It’s thinner than an iPhone 5, and seems proportionally as razor-thin as the new iPod Touch. In fact, the iPad mini feels very much like the new Touch, even down to the curved wrap-around aluminum shell and flat back. 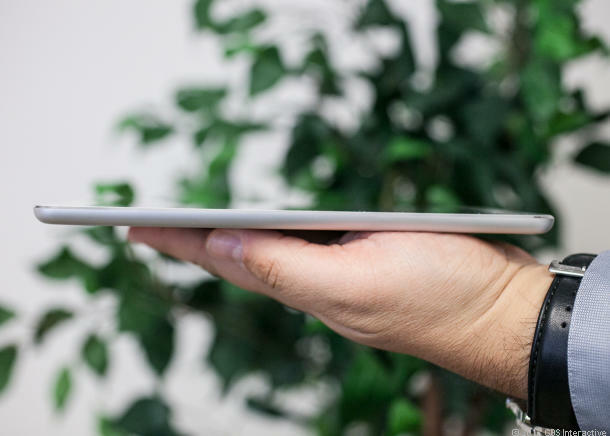 It lies down far flatter than the fourth-gen iPad, more like a wafer. The headphone jack at the top and Lightning connector and speakers at the bottom are carved into less-tapered, more-curved side edges. Around the front glass is an angled aluminum bezel like on the iPhone 5. The white model, which I reviewed, has a standard aluminum back. The black model has a slate-colored anodized aluminum, giving it that same stealth look as the iPod Touch. 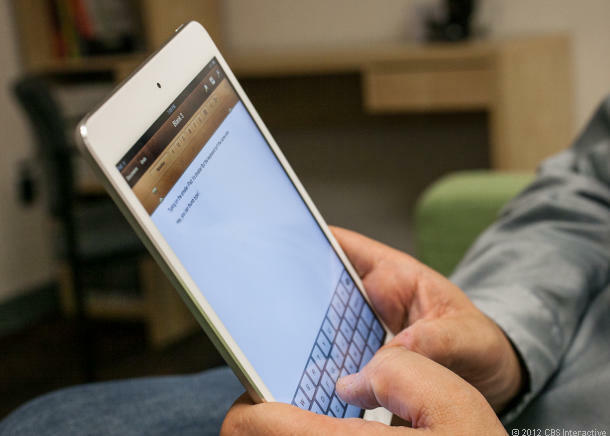 With its extremely whittled-down side bezels, the iPad Mini’s not covered in large bezel like the larger iPad, which always made it resemble a MacBook screen that floated away from its keyboard. The Mini truly feels like a large iPod Touch, which is exactly what we used to call the iPad back in 2010. It’s far more apt now. You probably won’t think that, though, because the iPad Mini won’t fit in your pocket, or even your jacket pocket. It’s more of a purse, small bag, or large-jacket pocket device. It’ll fit wherever you’d fit a softcover book. The construction feels solid, stellar, fun to hold. The home button clicks crisply. It doesn’t feel like a lower-priced product in your hands. It might be, in terms of form, the most addictive iOS product in existence. And it’s perfectly sized for kid hands. It’s a far easier car device and travel device. But, the Mini shouldn’t be a surprising product. A device smaller than the iPad that can run apps? That’s always existed. That’s called the iPhone. The really impressive feat of the iPad Mini, the surprise, is that it seems to handle all the iPad’s normal duties while being shrunken down. All except effortless onscreen typing, although it comes close. This entry was posted in Current Afairs, everyday life, Techmology, Uncategorized and tagged amazon kindle, apple, apple tablet, gadgets, gaming, ipad large price, ipad mini, ipad mini as ebook, ipad mini design, ipad mini for gaming, ipad mini good, ipad mini perfect size, ipad mini price, ipad mini specifications, iphone 5, technology, technology news.